Many of us like nothing more than getting our teeth into a great novel. 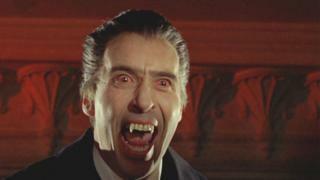 But in the case of Irish author Bram Stoker, it was to lead to one of fiction's most enduring characters - Dracula. Stoker's connections with the Yorkshire town of Whitby have been well documented. But it was his time in the Aberdeenshire village of Cruden Bay - or Port Erroll as it was known in his day - which appears to have unlocked his creative genius. Stoker had been sitting on his definitive work for years while working as business manager for the Lyceum Theatre in London before he headed to Cruden Bay for a holiday in 1893. He already had the plot and characters figured out - but hadn't made a start on the writing. That was all to change after he started visiting the Kilmarnock Arms Hotel in Cruden Bay. It was there, in room number eight, that the first few chapters of the book - which was finally published in 1897 - were written. Cruden Bay resident Mike Shepherd, who is a member of the Port Erroll Heritage Group, is writing a book on Bram Stoker's links to the village, where the author was to spend most summers for the best part of 20 years until his death in 1912. Based on his research from public sources and local archives, Shepherd believes that the village "nurtured" Dracula by giving Stoker the space, time and atmosphere to bring the character to life. "As early as 1890, he already had the plot and characters worked out but what I think happened is that he wanted to write Dracula as a popular book," says Shepherd. "But he was worried about the reputational issues in producing what was for its time increasing the horror ratchet of novels. "So basically he was blocked for several years, in my opinion, and that changed when he came to Cruden Bay. "Port Erroll fired up the boiler - it was the spark that got him going." But there were other factors at work as Stoker sat down to bring the character of Dracula to life, according to Shepherd. "What Stoker discovered in the village was an ambience of the supernatural," he says. "The local people here - as common at the time - were deeply religious but they also had a large amount of superstitions and traditions that had absolutely nothing to do with Christianity. "For example, when people were cooking they would stir their pots in the direction of the sun. To stir anti-clockwise would be asking for trouble - probably induce food poisoning. "And at Halloween they would march around the bonfire in the direction of the sun - they wouldn't go the other way." Accounts from Stoker's family - including his son Noel who was present in Cruden Bay in 1895 - suggest that Stoker immersed himself in the main character of his most famous novel while he was in Aberdeenshire. Shepherd explains: "There is some evidence from his family that he decided to get into the mindset of Count Dracula to help him to write the novel. "It drove his family absolutely bonkers because he started behaving very strangely. "He withdrew from the rest of his family and if he got interrupted while he was thinking out his book, he'd get very annoyed. "In fact, he spent most of his time walking up and down Cruden Bay beach, or sitting on isolated rocks on the seashore while writing the book. "It is a two-mile long crescent-shaped beach and, as he wrote in a later novel The Mystery of the Sea, he thought it resembled a mouth with the rocky headlines at either end looking like teeth. "He also mentioned that some of the rocks looked like fangs." Image caption Did Slains Castle help to inspire Stoker? Stoker's decision to start on his gothic horror classic may also have been fired by Slains Castle, which overlooks the North Sea. Shepherd explains: "I think Slains Castle, with its dramatic cliff-top setting, provided him with a degree of inspiration while he was thinking out his novel here. "There is some evidence that Bram Stoker used the floor plans of Slains to get him going while he was writing his book. "There's a very distinctive room that still survives in the ruins - the octagonal room. It is present in the novel, when Jonathan Harker arrives at Castle Dracula." Kilmarnock Arms Hotel owner Lucy Taylor says local weather conditions may also have helped to inspire Stoker during his stays at the hotel. She explains: "When the haar [cold sea fog] rolls across the front of the hotel it casts a spooky air, and we could imagine Bram Stoker sitting in his bay window looking out and picturing Dracula himself arriving in a cloak of dark mist." Bram Stoker's Cruden Bay connections have been acknowledged by his estate. His great-grand nephew, Dacre Stoker, was giving a lecture on his famous ancestor at the Kilmarnock Arms on Monday. He told BBC Scotland: "Cruden Bay has been on my list of 'Bram Stoker places to visit' for a few years. "I feel a need to be there to absorb the atmosphere and hopefully experience similar feelings of peace, relaxation, creativity, as Bram did during his many summers there." Dacre Stoker's visit is being welcomed by local residents. Shepherd says: "It is remarkable that of all the places Bram Stoker could have chosen to write his books, he chose an Aberdeenshire fishing village more than 500 miles form his London home. "I believe Bram Stoker found his spiritual home in Cruden Bay and anchored his soul here."